So, for awhile now I've had just my plain ol' Shaw modem connected into a nice Asus router. But then it started to have issues, and Shaw suggested I go with their modem/router deal. It was fine for a while but then I would notice our devices would be dropping WiFi for a few moments now and again before being restored (especially at night). It caused my wife to go over data once. 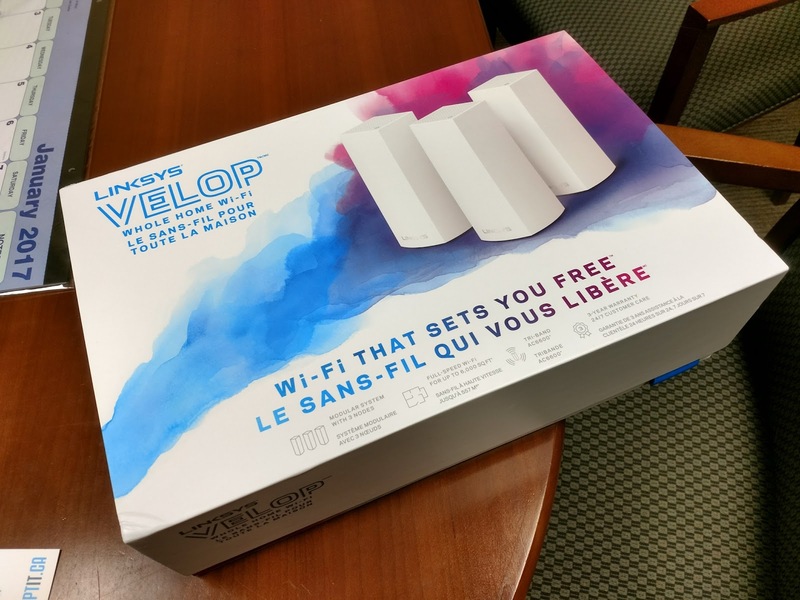 I was just about ready to take it back to Shaw but then I was handed this new package, the new Linksys Velop mesh WiFi system. I was happy. Not only was it a new product that might fix my current woes, but it looked very sleek. I had tried setting up a repeater type system before, but for unknown reasons it would stop working, so this all in one system was something I was definitely interested in trying. First up, I'm a sucker for good boxing. It's got this in spades, really helps you feel at ease knowing that you'll have a good experience. If they put this much effort into boxing the devices up, you know that the rest is just as good. The box opens up in flaps which revelas the 3 nodes and some information which then reveals the charging blocks. Each of them are neatly wrapped up just so. Again, just something that makes me excited. One of the things I really REALLY liked about this was the small things, like how the charging blocks connector was angled, so that when it connects to the node it can go in easily at an angle and the cord is kept safely away from being bent. It's the little things. Setting it up was easy. You need to use a phone to do it. Plug in the first node to power, load up the app and choose to set it up. It takes a few moments for it to detect the node and then you're ready to rock and roll. (Note: I chose to turn off the wifi of my Shaw modem/router, just so there's no interference). 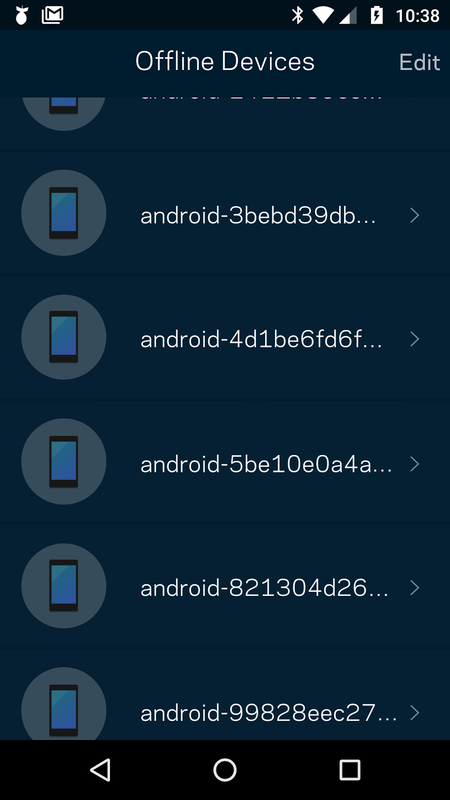 From there you personalize it with your own password, and then go ahead and add other nodes. So, I've gone and set up all 3. One downstairs next to my office, where the modem is, then another right as soon as you get upstairs into the kitchen. It hides perfectly on the shelf with all the white. My wife really approved of the design of these, so much so that that she let me put the other one on the half-table we have in the hallway just before the living room. It really just looks like it belongs in most decor. 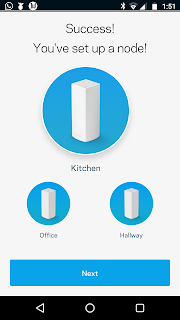 Now, there was one hitch in setting up the whole system, for some reason after it had connected the kitchen node, and while it was looking for it's'location' it just hung and never finished, so I had to swipe the app closed. Now the node showed connected, but the app never saw it. So I just hard-reset that node and re did it and it worked like a charm. Ever since hooking it up, the devices have never shown any drop in WiFi, they show full bars just about everywhere in the house (I can go farther in the yard before signal drops) and I notice there's no issues on any of the media boxes any more. This has been perfect for me. What's really cool is how everything is run via the app on your phone. 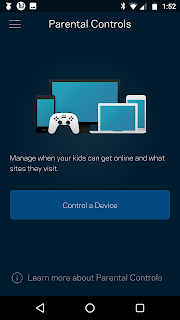 You can set up the password, guest access and parental controls. You can send the info for your set up to your friends via email, or text. There's even an option to prioritize devices, i.e. if bandwidth is getting too spread out (I have 16 connected devices in my home... if all were on at once you might see a drop) then the selected devices get the most of the bandwidth. The problem here is trying to identify which devices are which. 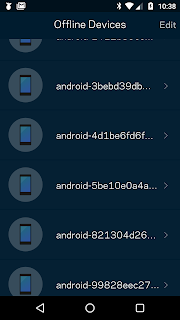 When I look at my devices list, some are easy to tell, the iPhone, Roku... but some are just a random looking number. I had to look at them and compare them to the mac address so I could give it a proper name. Luckily, I've not really needed to adjust any of those settings. 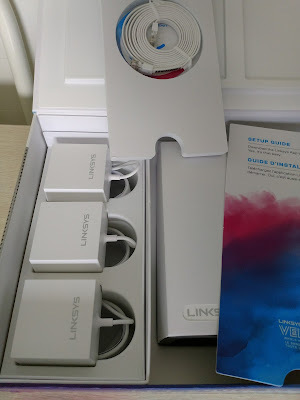 Overall, this is a great mesh WiFi system, that's sleek, super easy to set up and doesn't look like some ugly router in your home. 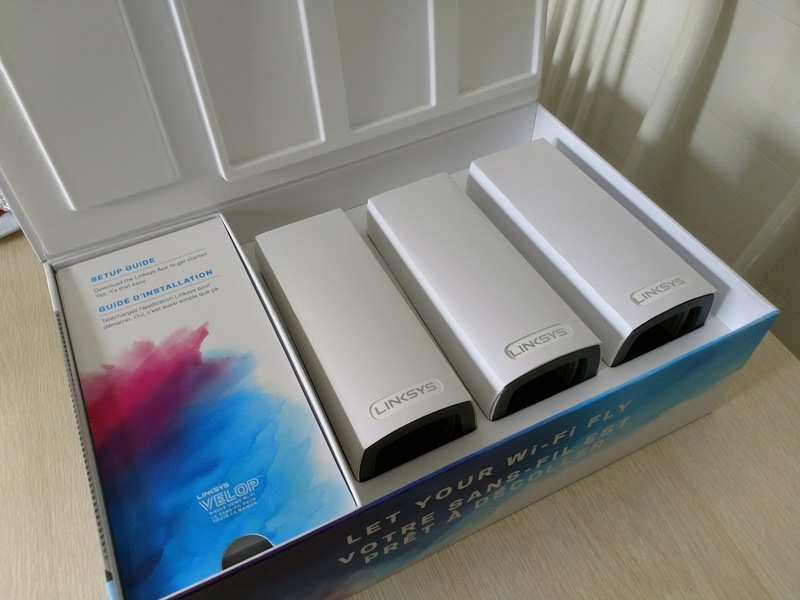 •	Velop is a Tri-band AC2200 with MU-MIMO system – helps provide faster speeds at the edge of the network by leveraging a third Wi-Fi radio for maximizing back-haul. This eliminates the “bottlenecking” effort that is present in Mesh solutions and current router + range extender networks. •	Dynamic Channel Selection solution – Both access points (Router, range extender etc.) and client devices (laptops, mobile phones, etc) communicate on the same channel. This impacts the Wi-Fi performance because of channel congestion and collision domain. 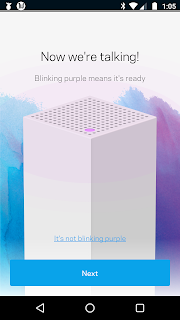 With Velop, the network and radio channel utilizations are constantly being monitored and evaluated Each Velop “node” will connect to downstream node on a different channel. This results in a more reliable Wi-Fi experience. 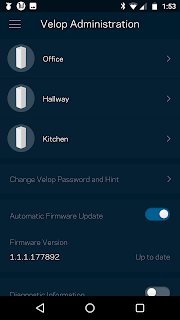 •	Linksys App - The Linksys App automatically identifies the nodes to be setup. 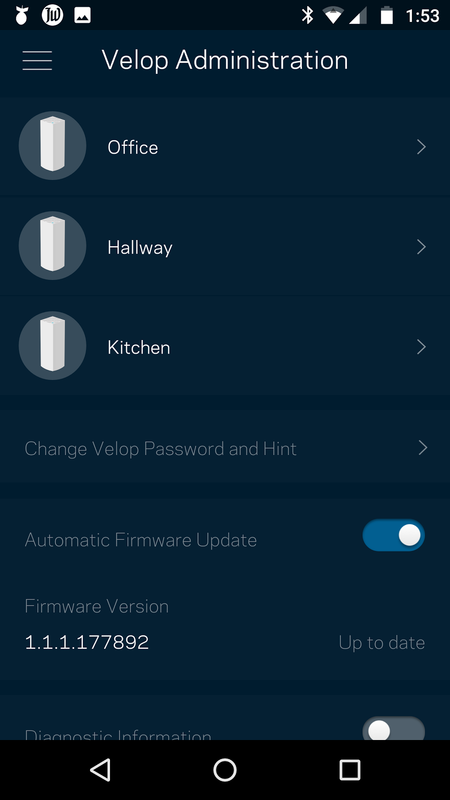 Connecting the 2nd and subsequent nodes is done with a single click from the Linksys App. 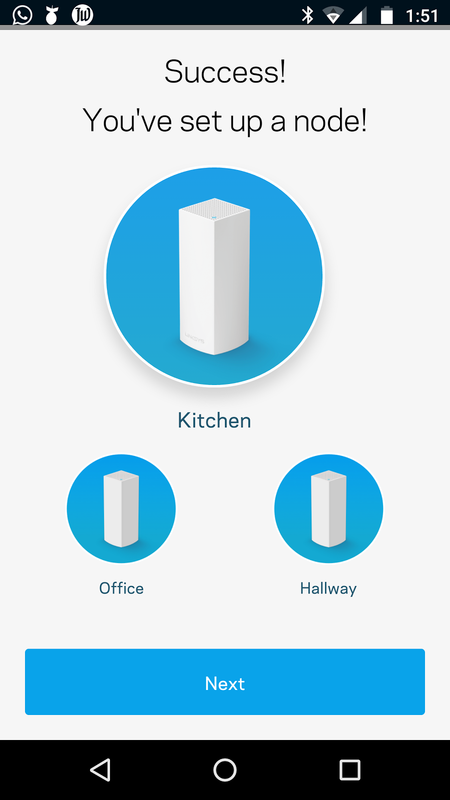 The Linksys App guides users through the process using animations where needed to explain the process and includes the Spot Finder technology for best placement. The App simplifies setup by automating as much of the setup of each node as possible. •	Spot Finder Technology (Patent pending) – The placement of each node is critical to have a reliable connection. During set-up, Velop will recommend the best placement to reduce latency, maximize throughput, improve range and signal strength. 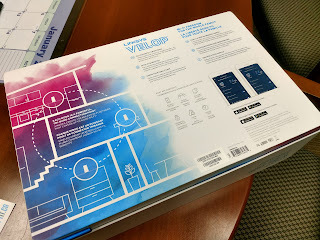 •	Linksys XConnect – Velop stays synchronized at all time. 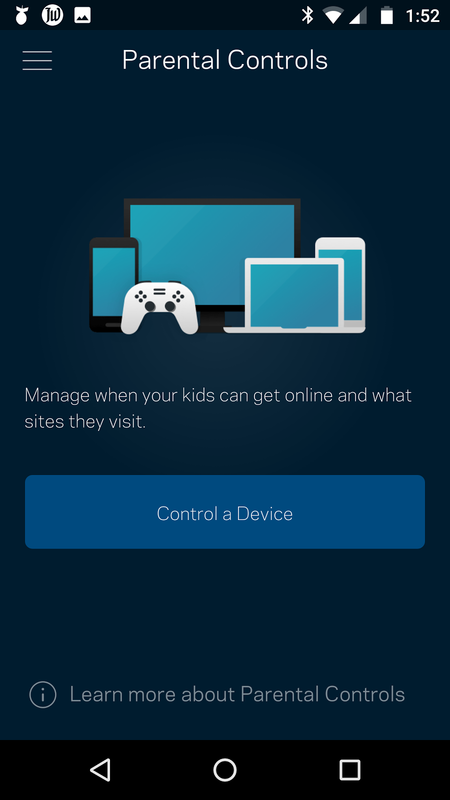 Linksys XConnect allows a secure and automatic exchange of network credentials between nodes at the time of set-up and anytime the network credentials are changed. In the future, XConnect will expand to other Wi-Fi client devices for seamless on-boarding. 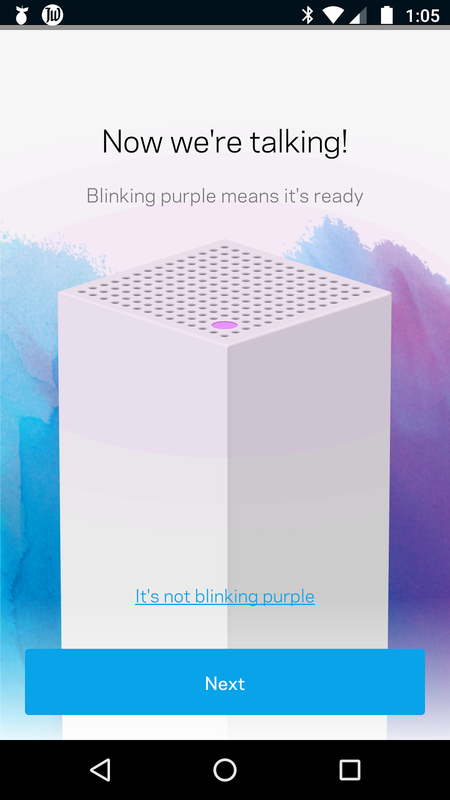 •	Velop and Amazon Alexa Cloud Integration – Velop launches with custom Alexa “skills” that can turn guest network on/off and request credentials of both the main and guest networks. Plans for additional Alex skills will roll out via firmware as they finalize. 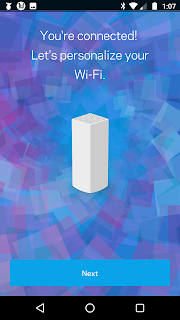 •	Seamless Wi-Fi Experience –Velop supports one network name & password, one admin login, one interface for management and monitoring, and one guest network for the whole home. As a result, mobile devices, such as iPhones and laptops, will roam seamlessly and reliably from node-to-node without interruptions. •	Velop™ Hardware – Velop uses a highly integrated System on a Chip, the first of its kind that incorporates a quad-core ARM Cortex-A7 processor, two Wi-Fi radios, and an Ethernet MAC. Additionally, there is a third discrete 5 GHz Wi-Fi radio used to provide a dedicated backhaul link between Nodes. It is complemented by 4GB of flash memory and 512MB DDR3 memory and a Bluetooth 4.0/LE radio for device setup. Velop has an 88% smaller footprint than a traditional router and has a tower design for higher antenna placement for better coverage.